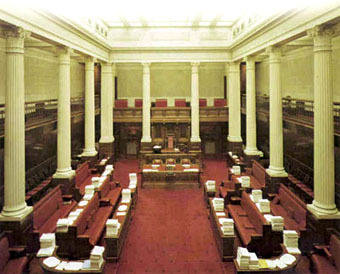 Interior of the Legislative Council Chamber in South Australia's Parliament House, corner North Terrace & King William Road, Adelaide. "I, like many others, hang my head in shame at the treatment of refugees in this country. It is almost impossible to fathom how we can treat other human beings in this manner. It is time that the nation's military intelligence resources and actions were directed towards detecting real terrorists, rather than stopping refugees from seeking asylum in our country as is their legal right." 22 October 2003: Australia's crimes against humanity not interesting to the media - Julian Burnside QC mounts a blistering attack on Australia's media, accusing it of refusing to report the government's escalating atrocities: "If the tragedy of our present regime is told dispassionately decades from now, the silence of the press will be seen as part of our national disgrace." 9 July 2003: Julian Burnside QC: Refugees: Australia's moral failure - A speech at a dinner launching 'Just and Fair Asylum' in Sydney on June 11 2002. "We diminish ourselves by the way we treat [refugees and asylum seekers]. Once we recognise that these people are human beings, we will see that the problem is in truth a moral problem and that we have made a profound mistake in the way we have handled it." 9 July 2003: Australia's Treatment Of Asylum Seekers: The View From Outside - A careful analysis of the criminal code therefore suggests that Mr Ruddock and Mr Howard are guilty of crimes against humanity by virtue of their imprisonment of asylum seekers, says Julian Burnside QC. "That the South Australian parliament condemns mandatory detention and the Pacific Solution as crimes against humanity." Well known refugee rights campaigner Julian Burnside QC spoke last month at the inaugural Don Dunstan Foundation Human Rights Oration about the vision of Ben Chifley, the Prime Minister of Australia from 1945 to 1949. For most of that time his deputy was H.V. Evatt who in 1948 was elected President of the United Nations General Assembly and who then presided over the UN's adoption and proclamation of the Universal Declaration of Human Rights in December 1948. Australia not only supported the adoption of the declaration, it also strongly advocated that the rights enshrined in the declaration should be enforceable, not merely a statement of hope or principle. Following the Great Depression and what Julian Burnside called 'the agonies of war', there were abiding values which most people would recognise as the essence of the Australian character, and he named these as mateship, generosity, openness and, above all, the idea of a fair go. "Our vision is now so clouded that a human rights problem is misrepresented as a threat to national sovereignty; that compassion is now seen as a weakness; that dissent is a mark of the newly despised elitism." He says, and I agree, that Australia's recent treatment of refugees, which since Tampa the Australian government has dressed up as border protection, violates all the values we once shared. Now we have about 300 asylum seekers languishing on islands in the Pacific for months or years at a time, where families are torn apart and the uncertainty hanging over people's future continues to cause great distress, in breach of our obligations under international law. The Universal Declaration of Human Rights is the most widely accepted international convention in human history. Article 14 provides that every person has a right to seek asylum in any territory to which they can gain access. But, when a person arrives in Australia without prior permission and seeks asylum, we lock them up. The Migration Act provides for the detention of such people until they are either given a visa or removed from Australia. In practice, this means that human beings, men women and children innocent of any crime except, according to the federal Liberal government, seeking asylum in our country are imprisoned for months or, in many cases, years and often indefinitely. Australia's so-called Pacific Solution is a fraud on the public and is fast becoming an international embarrassment. Our government pretends to respect the rule of law and loudly proclaims the importance of sovereignty, but the Pacific solution involves a resolute denial of the legal rights of asylum seekers. It breaches the Constitution of Nauru where, in the name of border protection, our government places refugees and governments of small, vulnerable nations in an endless holding pattern. In Article 5, Nauru's Constitution forbids detention except in specified circumstances; for example, after conviction for an offence or whilst awaiting trial for a serious offence where bail is not appropriate. The exceptions do not justify the detention of the hundreds of asylum seekers who have been taken there against their will. The Australian government knows that the asylum seekers are detained on Nauru. No competent lawyer could believe that the detention is valid under Nauru's Constitution. Rather, the government avoids acknowledging that the asylum seekers are detained, and this must be news to the asylum seekers themselves, who are strictly confined within the camps in which they are held. As it turns out, this is done by a legal trick. Article 5 of the constitution permits a person to be detained 'for the purpose of affecting his expulsion, extradition or other lawful removal from Nauru'. Asylum seekers are taken to Nauru against their will. They are held in order to expel them again. Australia pays Nauru over $1 billion for this process. Stranger still, the asylum seekers are given a visa, although they are not informed of that fact. A condition of the visa is that they must stay in one of the detention camps. As Julian Burnside points out to anyone who will listen, if the constitution forbids detention, a visa which imposes detention cannot be valid. Nevertheless, in May 2003, the Chief Justice of Nauru ruled these strange arrangements to be valid. This results in innocent people being detained for years on Nauru despite its constitutional guarantees. Allowing for the fact that the detainees have no competent legal representation, the judgment is a disgraceful piece of work: a veil too thin to hide the corruption which it attempts to justify. Nauru's constitution also guarantees access to legal help. The asylum seekers on Nauru have asked for legal help but have been refused. Pro bono lawyers from Australia have been refused permission to go to Nauru. In March 2003, an Australian lawyer arrived in Nauru with letters from detainees requesting his help. The lawyer drew attention to the constitutional guarantee of access to legal assistance. He was told by a Nauran official that they have come under enormous pressure from Australia to not allow lawyers, human rights workers or journalists to get to the detainees. The lawyer was put on a plane and sent back to Australia. By this device, the Australian government has isolated the asylum seekers from every legal system in the world. They may as well be in Guantanamo Bay. "We are a family of four people from Iran. We arrived in Australia in the year 2000 and since that time we have been imprisoned in a desert detention centre. My father's name is Habib and he is 42 years old. My father was a well-known merchant in Iran and had a big drapery shop selling curtains and material in Tehran, the capital of Iran. He often travelled to other Asian countries for business and he enjoyed his job. My mother's name is Soona, and she is 40 years old. She was a hairdresser in Iran and had her own hairdressing salon with some employees." "My brother is Tayeb and he is 18 years old. My name is Nosrat and I am 19 years old. My brother and I were high school students and loved studying and had a good and comfortable life in Iran. Due to an unexpected problem which my father faced, we were forced to leave our country. My father was a well-known merchant and had two salesmen working in his shop. Whenever my father was on business trips overseas, these two salesmen were running the shop." "One of the salesmen in my father's shop was a member of the Mujahedin Khalg Organisation, an outlawed and illegal organisation in Iran. He was an important and active member of this organisation. During my father's absence, this man misused my father's trust and used the facilities in the shop, such as the fax machine, for his anti-Iranian government political activities. Unfortunately, my father did not know about his political activities and his cooperation with MKO. The other salesman was not involved in any anti-government activities and was innocent like my father. Apparently the security agents were trying to arrest this man, and when they found out that he conducts all his anti-government activities from my father's shop, they rushed unexpectedly to my father's shop but they did not succeed to catch the MKO member and he ran away from the back door of the shop." "My father was out of the shop at this time and did not have any knowledge about this incident. The only person in the shop was the innocent second salesman. However, the security agents arrested him and took him away. They also searched the whole shop and took him away. They took some items and important documents which related to the MKO. These documents were found in the storeroom of my father's shop. MKO is one of the largest anti-Iranian government organisations and anyone who is a member or has any connection with it will be destroyed by the Iranian government. Unfortunately, all the evidence was against my father and he did not have any evidence to prove that he was innocent and was not a member of MKO. As I mentioned, because my father was a businessman and was financially well off and often had overseas trips, the Iranian government thought that my father was a member of this organisation and was financially supporting it." "In addition, because one of the members of MKO was my father's employee, so the Iranian government was certain that my father was a key member of this group and actively working to topple the government. The security forces started to search for my father. When he found out about this, he decided to flee the country as soon as possible with my family. That was the only thing my father could do in order to save his life. After our escape the government of Iran confiscated all our assets and belongings, such as our house, car, shop and my mother's hairdressing salon and bank accounts. Later on we found out that my father's second salesman whom was innocent and did not have anything to do with the MKO was murdered tragically by the security department." "When the people smugglers took us out of the country, we were taken to Indonesia. My father found out that the smuggler had decided to send us to Australia by boat. He told us that he could only take us to Australia. Without any other choice we were compelled to accept his offer. He loaded us onto an old wooden boat and we set sail towards the ocean." "At sea, we endured terrible conditions for fourteen days. We had only biscuits and water to eat and drink and at any moment there was a possibility that our boat might sink. It was extremely frightening and we felt that we were near to death. We tolerated this severe hardship and thought than when we reached Australia there would not be any other danger to threaten us. We thought that we would be treated like humans however whatever we had imagined turned out to be the opposite and our hopes had been futile." "On our arrival DIMIA and ACM staff were waiting for us and we were put into a detention centre. We have now been living in Australian detention for 3 years. These places I have only imagined in my nightmares. We have been imprisoned in a frightening desert camp, in South Australia, called Baxter. My family is separated from each other. My mother and I are in Woomera Housing and my father and brother are in Baxter detention, they are surrounded by razor wire, fences and electric gates. When they put me into detention I was 16 and my brother was 15. I pleaded with them a lot. I cried a lot and asked them to let me go to school, to study but those DIMIA hard-hearted people took that dream and desire away from me and made our life harder." "After our arrival in Australia we had some interviews. Our application for seeking asylum in Australia was rejected by the RRT. The Immigration officials select people in a subjective manner and their judgment is not just. We have faced a great injustice. When our Federal Court hearing was finished, we had to wait for a long time for a result however finally (our case was approved). However to our dismay in the end the Minister for Immigration appealed against our case and our application was rejected (dismissed). This showed another injustice towards us." "At the present moment we are in the process of appealing to the High Court, however we do not have any hope for this to be successful and we despair for our future. Living in these conditions is unbearable. My family have lost many things, for example my parents now face severe psychological stress and need to take medication." "The joy and happiness that my mother once had can no longer be found on her face. Seeing her suffering, with her tearful eyes, in this prison makes it unbearable for me. My father blames himself for bringing his family to this desert jail. This is also a torture for me. I have never felt as I feel now, how unfortunate I am." "I am writing this letter to request you to assist and help us and write a letter to the Minister of Immigration to use her power and authority and reconsider our case. I swear to you by God and ask that you please not let my family rot and decay in this desert jail. Please help us to once more experience and feel the freedom beyond these fences." Asylum seekers in this country are held in the most shocking and appalling conditions where the freedom they have dreamed of is prohibited and their every move inside the confines of a detention centre is watched 24/7. The United Nations Human Rights Commission has described conditions in Australia's detention centres as "offensive to human dignity". The United Nations Working Group on Arbitrary Detention has described these detention centres as "worse than prisons" and has observed "alarming levels of self-harm". They have found that the detention of asylum seekers in Australia contravenes Article 9 of the International Covenant on Civil and Political Rights which bans arbitrary detention. Julian Burnside QC told the audience in Adelaide last month that the delegate of the United Nations Human Rights Commissioner who visited Woomera described it as 'a great human tragedy'. Human Rights Watch and Amnesty International have repeatedly criticised Australia's policy of mandatory detention and the conditions in which people are held. Despite its newer facilities, the Baxter Detention Centre inside our state borders is as bad and some say much worse. Human rights organisations all around the world have condemned Australia's treatment of asylum seekers. Only the Australian government is untroubled by our treatment of innocent, traumatised people who seek our help. If the United Nations were debating the wording of the Declaration of Human Rights now in 2003, the federal Liberal government would oppose it. Julian Burnside contends that, if by a quirk of geography we were eligible for membership of the European Union, we would be excluded because of our treatment of asylum seekers. This eminent QC reminded the audience on 26 September that punishment is central to judicial power and that, because of the separation of powers entrenched in the Australian Constitution, only a judicial court can inflict punishment on a person. Locking a person up is regarded in this country as punishment. However, the High Court has acknowledged that there are circumstances where detention is necessary for the discharge of an executive function. In those limited circumstances, detention (imposed directly and without the intervention of a chapter III court) will be constitutionally valid. This holds good only as long as the detention goes no further than can reasonably be seen as necessary to the executive purpose to which it is ancillary. Theoretically at least, detention might continue for the rest of a person's life and the Solicitor-General did not shrink from that possibility, whilst contending that in the real world such a thing would not happen. Put simply, the Solicitor-General (on behalf of the Minister for Immigration) submitted to the court that, if it came to the point, Mr al Masri could be locked up for the rest of his life even though he is innocent of any offence. To lock up an innocent person for the rest of their natural life is (as Julian Burnside contends) a chilling possibility. For a government to seek such a result is so alarming that it is difficult to associate it with modern Australia. The judgment from which I have just quoted was delivered on 15 April this year. The court rejected the government's argument and said that the minister could not hold a person in detention for the rest of his life. The government is, to our national shame, determined to challenge the decision. In another case the government argued that, no matter how harsh the conditions in Woomera might be, they were nevertheless lawful, and a court could not interfere. Because of the way in which the question arose, the government had to argue (and it did argue) that even the harshest conditions of detention imaginable would nevertheless be lawful. These are, according to Julian Burnside, arguments worthy of the legal positivists of the Nazi regime. And it gets worse. When a person ultimately fails in their claim for a protection visa, the Migration Act requires that they be removed from Australia. In practice, that often means that they will be returned to their country of origin. At the present time there are approximately 200 Iranian asylum seekers in Australia's detention centres who have been refused protection visas. A number of these people live in genuine terror of the prospect of being returned to Iran - and understandably so. Many of them have embraced Christianity, and apostasy is a very serious offence in Iran. Others belong to minor religious groups whose members are regularly subjected to terrible treatment in Iran. Some belong to human rights organisations which are campaigning for freedom and for a pluralistic democratic government to be established in Iran. After describing to the audience back in September a videotape that he has in his possession which shows an Iranian man's eyes being pulled out with forceps by government officials, Julian Burnside told the audience about an Iranian man whom he knows whose claim for asylum had been rejected. This man lives in fear of being returned to these conditions. He applied to the court for orders preventing the government from returning him to Iran. The case theory was simple: the power to remove a person from Australia does not go so far as allowing the government to send him to a place where he faces torture or death. The government sought to strike out the claim without a trial on the facts. It invited the court to assume the truth of all the facts alleged and argued that those facts had no legal consequences. On that footing, the government's argument was this: it does not matter that this man will be tortured when he is returned, it does not matter that this man will eventually be killed when he is returned, but that, nevertheÂ­less, the government has the power and the obligation to return him to the place where that will undoubtedly happen. I, like Julian Burnside, believe that any government willing to collude in such actions is violating international law and betraying the values that Australians hold dear. But still it gets worse. The so-called management unit at the Baxter Detention Centre is solitary confinement bordering on total sensory deprivation. I visited the management unit and watched the prisoners on closed-circuit TV and tried to reconcile what I saw with what I thought I knew of Australia. Julian Burnside viewed a videotape of one of the management unit cells and described it to the audience last month. The video shows a cell about 3½ metres square with a mattress on the floor. There is no other furniture; the walls are bare. A doorway (with no door) leads to a tiny bathroom. The cell has no view outside; it is never dark. The occupant has nothing to read, no writing materials, no television or radio, no company, and yet no privacy because a video camera observes and records everything 24 hours a day. The detainee is kept in the cell for 23½ hours a day. For half an hour a day he is allowed into a small exercise area where he can see the sky. No court has found him guilty of any offence; no court has ordered that he be held in this way. When I toured the management unit earlier this year, all the cells were full: full of men who had been put in solitary confinement for weeks, just in case something happened over the Easter weekend. Now we lock people up on speculation. It seems that our government is relaxed and comfortable with the idea of imprisoning innocent people. The Howard government conceals the worst aspects of on-shore mandatory detention by putting most of the detainees in remote desert camps hoping the detainees will remain nameless and faceless; out of sight and out of mind. It conceals the worst features of the Pacific Solution by making it virtually impossible for Australians (especially lawyers or journalists) to visit Nauru or Manus Island. The secrecy surrounding the contracts with the detention centre operators, the lack of proper agreements between state and federal governments, and the lack of transparency and scrutiny of conditions has meant that allegations of human rights abuses cannot be properly investigated. In 2002, along with more than 80 other nations, Australia acceded to the Rome statute by which the International Criminal Court was created. This court is the first permanent court ever established with jurisdiction to try war crimes, crimes against humanity and crimes of genocide regardless of the nationality of the perpetrators and the place where the offences occurred. As part of the process of implementing the International Criminal Court regime, Australia has introduced into its own domestic law a series of offences which mirror precisely the offences over which the International Criminal Court has jurisdiction. So, for the first time since Federation, the Commonwealth of Australia now recognises genocide as a crime as well as various other war crimes. The Australian Criminal Code also recognises various acts as constituting crimes against humanity. Section 268.12 is of particular significance in the present context. In summary, this section covers crimes against humanity of imprisonment or other severe deprivation of physical liberty where the perpetrator commits an offence if the perpetrator imprisons one or more persons or otherwise severely deprives one or more persons of physical liberty; if the perpetrator's conduct violates articles 9, 14 or 15 of the International Covenant on Civil and Political Rights; and if the perpetrator's conduct is committed intentionally or knowingly as part of a widespread or systematic attack directed against a civilian population. The elements of these offences are relatively simple: where the perpetrator imprisons one or more persons; the conduct violates article 9 of the ICCPR; or the conduct is committed knowingly as part of a systematic attack directed against a civilian population. Australia's system of mandatory, indefinite detention appears to satisfy each of the elements of that crime. The minister and Mr Howard imprison asylum seekers. The United Nations Working Group on Arbitrary Detention has found that the system violates article 9 of the ICCPR. Their conduct is intentional and is part of a systematic attack directed against those who arrive in Australia without papers and seek asylum. A representative of the International Criminal Court has expressed privately the view that asylum seekers as a group can readily be recognised as "a civilian population". They are an identifiable civilian cohort. If moral arguments have no traction with our law-makers, it remains the fact that our government is engaged in a continuing crime against humanity when assessed against its own legislative standards. If the universal declaration of human rights were being debated now, Australia would oppose it. The Prime Minister resents interference from the international community, just as the previous minister for immigration showed just how much he resented interference from the courts. We have fallen a long way. We have squandered the legacy of our past. "It is too timid to be decent; too frightened to admit mistakes, it has vanished at the time when it might urge compassion and honour and decency. Don Dunstan would have wept to see his ideals - his party's ideals, his country's ideals - so betrayed." I, like many others, hang my head in shame at the treatment of refugees in this country. It is almost impossible to fathom how we can treat other human beings in this manner. It is time that the nation's military intelligence resources and actions were directed towards detecting real terrorists, rather than stopping refugees from seeking asylum in our country as is their legal right. I seek leave to conclude my remarks.